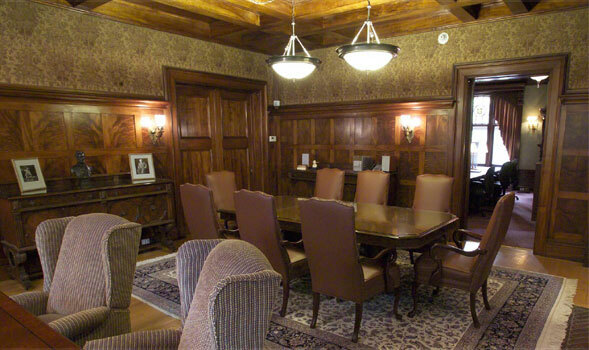 Now Nelson Thomas’ office, this room was originally built by Henry Alva Strong to serve as his study. Libanus Todd also used the room for his study with his large desk located near the front East Avenue window. The walls and ceiling are made from a rare Koa wood from Hawaii, unique for its grain, rarity and natural hues that range from gold to red to dark brown. Strong shipped the precious wood back during visits to Hawaii to see his daughter. The light fixtures and the tapestries, which were custom made and imported from Italy, are original. It has been said that this room contains a secret hidden panel leading to another room in the house. A former mayor of Rochester said he played in it as a child. The panel’s location has not been found. Some say the secret panel never existed, save as a ruse parents told their children to keep them endlessly occupied in the search.